I'm interested in planning Oregon Debates! I'm interested in participating in Oregon Debates! 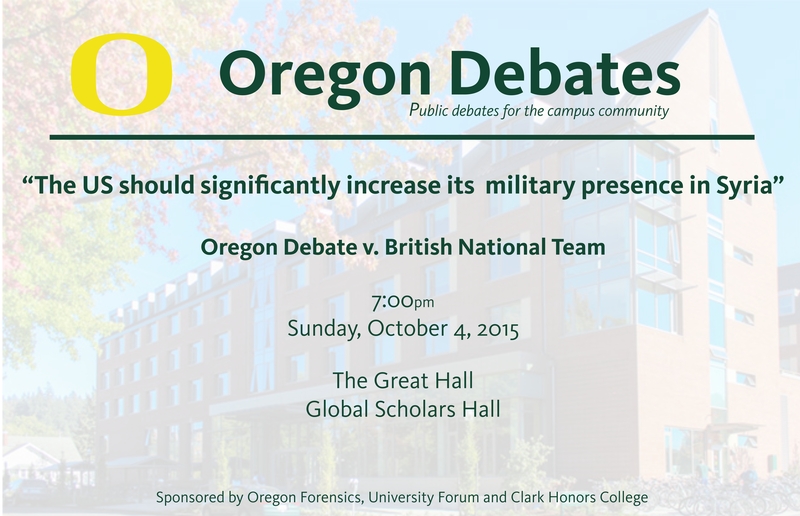 The first event in the Oregon Debates series occurred in the Global Scholars Hall on October 4, 2015. The Oregon team of Drew Escalante and Sean McKean squared defended the propositionthat the “The United States should significantly increase its military presence in Syria” while the visiting British National Team of the English Speaking Union opposed. The debate is the first in a series planned for CHC students living in Global Scholars Hall but open to the campus community and the general public. Called “Oregon Debates”, the series features CHC students in public debates on topics of interest to CHC students and the campus community. The British National Team tours a small number of American campuses and Oregon is jointly-hosting the 2015 team with Linfield College and Willamette University. In addition to the debate about Syria, the British participated in round-table discussions with CHC students and debated a local high school team on the merits of the American Revolution. The 2015 British National Team is among the very best in the world. Chessy Whalen recently earned her BA in History at Balliol College Oxford and was an active member of the Oxford Union Debating Society, competing at national and international tournaments. She was a quarter-finalist at the European Championship. 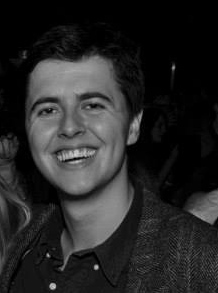 Matthew Wilmore recently received an LLM in Human Rights at the University of Edinburgh following a First Class Honours from the University of Sheffield in Politics and Philosophy. Wilmore won the 2014 European Championship and has recently worked promoting debate around the world. The University of Oregon is a long-time leader in college debate, including participating in one of the first intercollegiate debates and inventing the type of debate practiced in much of Southeast Asia (“Oregon-Oxford style debate”). Since 2000 Oregon has won four National Championships in parliamentary debate and appeared in the final round five times. In 2014 Oregon had the top team at the prestigious invitation-only National Parliamentary Tournament of Excellence and finished 3rd in 2015. As a program Oregon finished fourth in the country last year.